Ai Editorial: Are indirect channels gearing up for “offer”-based selling? Airlines’ quest of being a top-notch retailer has two dimensions. The first one is about how they end up crafting an offer and sell it via their direct channel. This can be under their control provided airlines are willing to challenge the status quo, especially if they believe they are being held back by systems and technology that has been around for a long time. The second dimension, which is about ensuring consistency in travel shopping via 3rd party channels, isn’t under their control. As much as carriers are gearing up to do their bit to capitalize on a passenger’s willingness to pay, they are also keenly following developments pertaining to IATA’s New Distribution Capability (NDC) to sharpen their overall distribution strategy. For a carrier like Frontier, 42.4% of its total revenue was accounted by ancillary revenue last year, according to a recent study released by IdeaWorks Company. Ancillary revenue per passenger was $48.33. This figure was led by Spirit ($50.97). 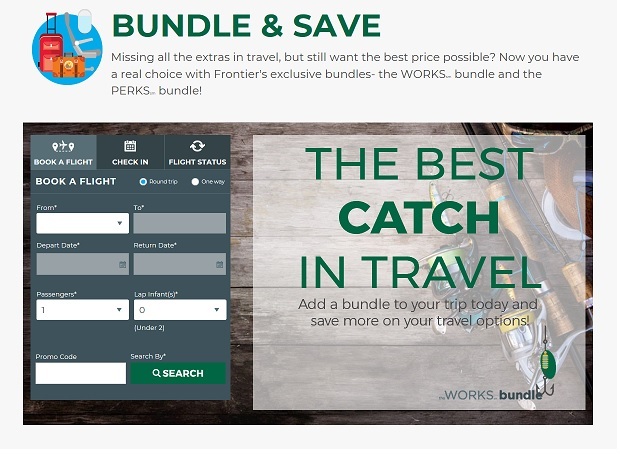 Frontier has worked upon a la carte offering, featuring both unbundled and bundled service options. For instance, the Works and the Perks bundles. Certain options are only available via Frontier’s own channels. The carrier underlines that when low fares come along with choice (paying for what one opts to avail) and there is transparency regarding the same, then customers can buy with confidence. For instance, the Works option includes carry-on bag, checked bag, selection of seat, priority boarding, refundability and change flights option. “The airline might have designed a compelling offer, but it’s also necessary that customers fully understand the offer and their choices before they make a commitment,” mentioned Robinson, highlighting the significance of managing the experience crafted for airline-owned channels on indirect channels. It is clear that NDC is a new messaging standard and airlines have to look at factors such as organizational investment and focus on the efficacy of their technology to support their retailing plan. In the distribution world, the complexity primarily comes from the fact that in the indirect channel, the industry is attempting to utilize systems, fare filing etc. not designed to manage product bundles or ancillaries in general. What airlines have been finding attractive with NDC is doing away with filing of fares, and all priced offers to be created by the airline’s Offer Management System. “In the future, when we refer to pricing, we’re going to be considering the total offer price. That includes airfares, bundled offers, a-la-carte ancillaries…all inter-related to one another. We’ve made a lot of progress in our customer-centric offer management. And we’ve been making progress to extend offers for customers who book on OTAs and through agents, but the limitations of traditional distribution means that those customers really must come to Frontier – to our website or mobile app – to benefit,” said Robinson, who indicated that progress is being made in this area by citing the example of Skyscanner and the sort of association the meta-search engine has had with Scoot and Finnair for NDC-enabled bookings. As for the interface and overall UX on meta-search engines, OTAs etc., Robinson feels the industry is going to evolve from base fare-oriented search results. He expects these players being able to pull in more information from their visitors about what all they are looking for when they travel and accordingly come up with ranking of offers not just fares in the search results. Even as airlines have done fairly well in modifying merchandising flows in their own channels, a big question is how indirect channels can improve on the same. Conglomerates such as Amadeus and Sabre have indicated that they have been working with IATA as well as running projects for industrialization of NDC. They are looking at securing full booking flow automation including post-booking services and efforts to develop the scalability of the technology. Scalability in retail (OTA) shopping really needs some important changes for NDC to gain wider adoption. Response times are considered too slow and volumes in that area present challenges. That’s one of the reasons that TMCs have been among the first to adopt NDC; they don’t have all the shopping requirements that a retail environment does. Also, as an executive associated with one of these conglomerates pointed out, comparing all offers from various airlines on mobile plus enabling mobile users to take a decision accordingly would call for massive transformation on the part of various stakeholders in the indirect distribution value chain – be it for preparing for NDC content or improvising on the technology that powers search or the functionality/ UI of digital intermediaries.